I spent 1987 in Columbia, Missouri, a student in the Graduate School of Journalism there at the University of Missouri. I rented a small one-story house of four rooms with a small front porch, a small front yard enclosed by a chain link fence, and a large back yard with no fence. In one corner of the porch were two front doors set at a right angle. The doors opened in to separate living rooms. I used only one door and one living room, the one with the large heating vent covered by a metal grate set in the floor. A few doors down, on the corner, was a particularly small white clapboard church. Many nights it grew big, rocking with hallelujah and song. The house was about a mile north of the university, and most often I would walk or bike to class taking Hickman to Eighth then over to Ninth which led me through downtown to campus. The only downtown establishment I remember is a pool hall called Booches. There you could get a beer and a great burger and fries. Sometimes I would drive to campus. I had a VW Rabbit, fire engine red. It came in handy for my jobs—I worked for a while delivering newspapers, for a while delivering pizza. 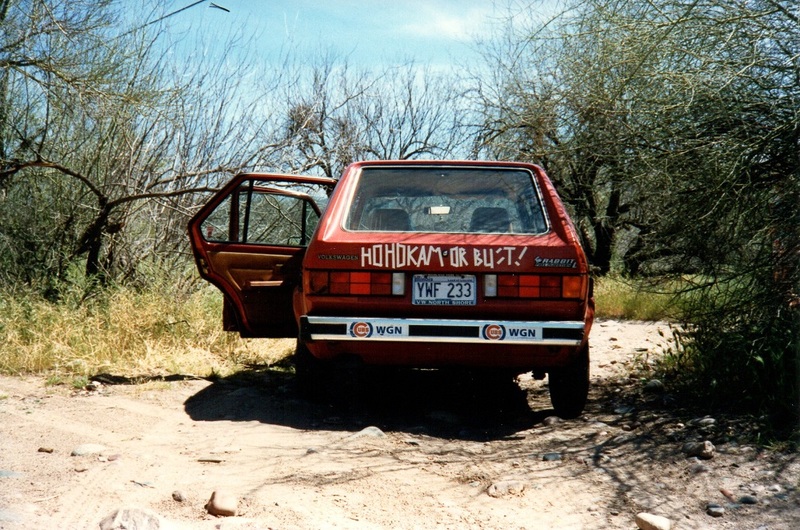 In the spring of 1987 I used my VW Rabbit to get out of Columbia and to Ho Ho Kam Park, the spring training facility of the Chicago Cubs, in Mesa, Arizona, a trip of about 1,500 miles. I took with me my dog, Dandy, and met there my sister Jennifer and her partner, Jill. We stayed for a few days at the Western Lodge in a room with a kitchenette and a color TV. The motel had a pool that I remember as littered with leaves or dead bugs or something. Jennifer and Dandy at the motel. We went to a few Cubs games, lounging on metal risers, sunbathing, drinking beer, talking with fellow fans, taking pictures of ballplayers. It was the year Ryne Sandberg sported a mustache, and I tried to get a picture of that. One day the Cubs played the A’s, and I got a nice picture of Reggie Jackson warming up, doing leg stretches. I got a picture of a bare-chested, gold-chained Shawon Dunston signing autographs outside the Cubs locker room. There is my sister in the crowd, raising her scorecard and pencil. We also spent time in the desert, went out to bars, hung around the motel room. We ran into people we knew from back in the bleachers at Wrigley Field. One was a woman I knew only as “Tidbit.” She wore nothing from hair ribbons to shoelaces if it did not sport a Cubs emblem. Another was the woman who worked as the bathroom attendant under the right field bleachers. Beneath the stands at Ho Ho Kam was a batting cage and we hung out there a bit, watching Andre Dawson, Bobby Dernier, Thad Bosley, and others take their swings. In my notes from the trip, I see that one day: “I got Thad Bosley’s autograph and fell in love.” One night eating out at a Chinese restaurant we saw the legendary Billy Williams and, for 30 seconds, I talked to Thad Bosley. Bosley was an outfielder, not an everyday player, but an excellent pinch-hitter—the kind of guy who bounced around playing for a few different teams in a good, but maybe not great, career. He had his best years with the Cubs, joining the team in 1983, and if the Cubs had ever made it to the World Series while Bosley was there I could well imagine him coming to the plate in the bottom of the ninth with two outs, the whole spiel on the line, and there he would go popping a base hit or a home run or whatever was needed. He was that kind of player, just doing his job. Plus, he was good-looking and could sing. One evening at a bar we found ourselves sitting next to Dan Gladden. A conversation began when my sister recognized him, said something like Hey, aren’t you Dan Gladden? Somehow this impressed him. He was kind of crying in his beer because he had just been traded from the Giants to the Twins, that’s San Francisco to Minnesota, San Francisco with a won-loss record of 83-79 to Minnesota with a won-loss record of 71-91. Gladden felt his career was over. But Jennifer set him straight—she knew he was a good ballplayer, and she told him so, illustrating with a story or two about specific plays and at-bats she had seen. A few months later, I was watching the World Series at Booches cheering wildly for the Twins, who were playing the Cardinals, and there I was deep in Cardinal Country, St. Louis being just two hours from Columbia, and Cub fans and Cardinal fans (as you may know) have an unusually antagonistic bond, so I was risking my life, rooting for the Twins, and I know all too well how peckish Redbirds can be when they lose, their feathers all ruffled and out of place, which comes from, I imagine, lack of experience, but, anyway, that year, in the World Series, the “Twinkies” were my team, Dan Gladden my man. To the Twins’ eventual victory he contributed seven RBIs, four of which came in a Game One grand slam. Driving to Mesa, I spent the first night in Oklahoma City and the next in Gallup, New Mexico. 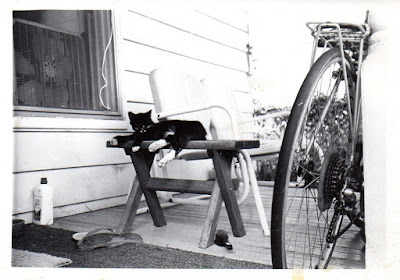 It seems strange to me that on my recent trip west it didn’t cross my mind that I had been down America’s historic Route 66 before, had spent a night in Gallup before, just me and my dog, though of course in 2014 it was just me and my cat. 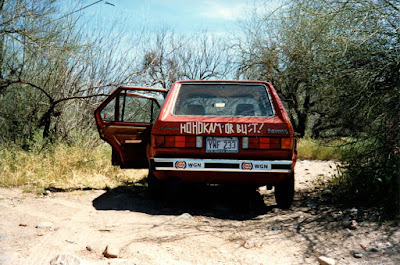 In 1987, I stayed at the Road Runner Motel in a room with Magic Fingers and WGN-TV. Earlier that day—a Friday, March 13—I had stopped for gas in Clines Corners. The attendant, a skinny, toothy guy with just a few missing, asked me if I knew the people in Chicago who had committed suicide. I had read about four teen-agers, I thought from Pennsylvania, who had committed suicide together and thought that was what he referred to. As I was leaving he said, “Don’t commit suicide. 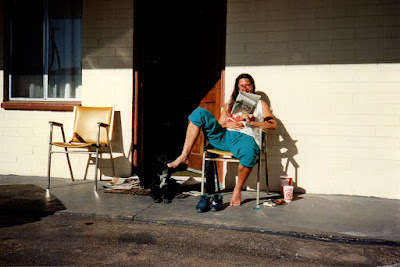 Life’s OK.” That night in Gallup I watched the news, saw there had been another suicide pact carried out in a town called Alsip, not far from Chicago. Driving home from Mesa I did not stop. Not to sleep, anyway. I drove straight for 30 hours, my only drugs being caffeine and nicotine. It wasn’t the plan, just what happened. I remember thinking somewhere around Oklahoma City If I don’t stop now, if I don’t stop now and sleep, if I don’t stop now and sleep in Oklahoma City which of course is the only sensible thing to do, I will not stop, I will drive all the way to Columbia with no sleep, no sleep at all since Mesa, no sleep at all since Ho Ho Kam Park, and that is crazy; and I remember at some point—maybe in southern Missouri around dawn—feeling desperate for coffee and more and more cigarettes. Could there possibly be enough coffee and cigarettes to keep me awake? And I remember huge rolling clouds and a long rolling road and I remember that I made it home safely, where the drains were all clogged and the cats had peed here and there and barfed everywhere else; to where University administration had sent me a letter threatening to kick me out of school unless I came up with proof of a measles vaccination; to where my landlord came quickly to try to fix the clogged drains but he couldn’t; to where my cat sitter wandered by just after I had fallen asleep on the sofabed in the living room, where I usually slept, a la Mary Richards, but I did not have a big “L” on the wall, and I usually was not sleeping in the middle of the afternoon or whenever it was, and his knocking on the door woke me up but then I fainted dead away, right at his feet. When I came to babbling about Ho Ho Kam it freaked him out. That year the Cubs finished last in their division with a record of 76-85. Despite being in Columbia through the summer, I managed seven visits to Wrigley Field. I went twice to Kansas City—neither time was Bosley, who had been traded to KC at the end of March, in the line-up—and to Busch Stadium, in St. Louis, three times. I kept score for several games I watched on TV, either via WTBS or NBC (I railed against the local cable company for not having WGN in their line-up—they told me, and I can still hear the shrug in the voice, “We took a vote, WTBS won”), and I worked the sports desk at the Columbia Missourian under the guise of News Reporting and Editing 101 or something like that. It was great to go to the newsroom and get wire reports of the games. That summer I read “Baseball’s Great Experiment: Jackie Robinson and His Legacy” by Jules Tygiel, and a friend sent me “My Brother Morris Berg, The Real Moe,” an unusual book written—or should I say put together—by Berg’s sister, Edith. Moe Berg was a catcher in the 1920s and ’30s, playing for a few different teams. He was also graduated from Princeton, the Sorbonne, and the Columbia School of Law. He spoke a dozen or so languages, travelled the world, was one of the first ball players to visit Japan, to take baseball across the Pacific. He was a son of Russian immigrant Jews. During World War II, Berg served the U.S. as a spy. 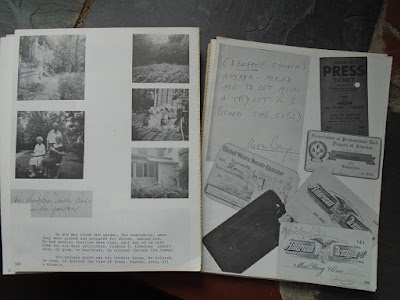 The book is a hodge-podge of photocopied letters, memos, notes, photographs, receipts, telegrams, itineraries, speeches, newspaper articles, and more interspersed with scraps of vignettes and memories written by Edith. I didn’t know if I still had the book after all this time, but I found it in the crate with my scorecards, and it is falling apart—its spine was already cracking back in 1987. I remember holding it together with rubber bands.